I also got no idea why my blog had became DiGi Hate Blog already…. But im still using DiGi, cos i still think other Telco is not as best as DiGi. Just like why im still using streamyx while its sux till max. 2. Sign up Successful. Note the date! 3. Then I tried to send out my 1st tweet from the service. OH MY GOD…. kennot type “T” and some other letters. (12:31:28 pm) Thank you for using D’Chat, a Customer Service Consultant will be with you shortly. (12:33:04 pm) Your chat session has started..
(12:33:17 pm) DiGi CS: Hi, welcome to D’Chat. My Name is GOBIDASAN. How may I assist you? (12:33:33 pm) DiGi CS: Hi,I’m Gobi.How may I assist you? (12:34:20 pm) DiGi CS: How may I assist you pleasE? (12:34:36 pm) DiGi CS: Alright..
(12:34:45 pm) DiGi CS: How may I assist you regarding this service? (12:34:59 pm) DiGi Customer: i would like to ask about the service. the charge is RM1/week right! (12:35:19 pm) DiGi Customer: then whats the RM1 about? What actually do i pay for the RM1? 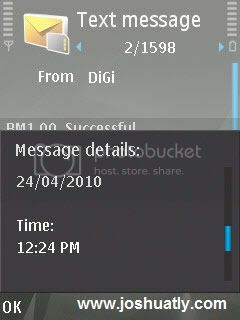 (12:35:49 pm) DiGi Customer: if i already sign up RM1/week, when i tweet via sms, how much do digi charge me per tweet? (12:36:42 pm) DiGi CS: you will not be charged per tweet..it is weekly charged. (12:37:13 pm) DiGi Customer: oh. 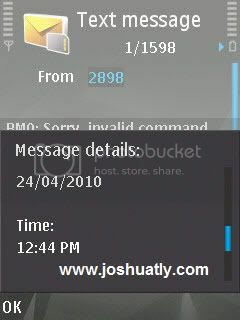 then how about the “Sending tweets and performing other Twitter featuresfrom mobile910 sen per SMS” about? (12:39:05 pm) DiGi CS: Sorry…the RM1 is to receive unlimited alerts..
(12:41:20 pm) DiGi CS: yes..
(12:41:24 pm) DiGi CS: Is there anything else I may help you with? (12:41:26 pm) DiGi Customer: how is the alerts work? (12:41:43 pm) DiGi Customer: how long is the interval i receive an alert? (12:45:02 pm) DiGi CS: Thank you for waiting. (12:46:15 pm) DiGi Customer: anyone related? means those people i fllow? 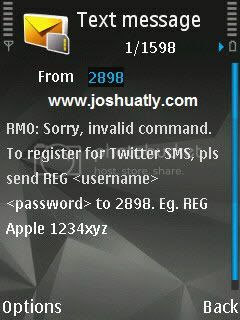 (12:46:36 pm) DiGi Customer: or those who signed up for DiGi SMS Twitter service only? (12:48:27 pm) DiGi Customer: oh no DiGi….. had you did this right? (12:50:45 pm) DiGi CS: ok..may I know when you registered the service?. (12:51:44 pm) DiGi Customer: wait. (12:51:46 pm) DiGi CS: Sure..
(12:54:03 pm) DiGi CS: Alright, I will do a report regarding this service and request the relevant department to check further. They will revert to you within 24hrs time on the updates. (12:54:07 pm) DiGi CS: Sorry for the inconveniences. (12:55:17 pm) DiGi Customer: means they will call me? (12:55:54 pm) DiGi Customer: then can i unsubscribe now and get back all the money? cos im sick of this. (12:57:00 pm) DiGi CS: We need to check first..and then if there is issues we will refund your amount. (1:00:57 pm) DiGi CS: Is there anything else I may help you with? (1:01:01 pm) DiGi Customer: OK. i hope will get the call within 24 hours time. (1:02:24 pm) DiGi CS: I had sent the report and also highlighted the issue.So, once it is checked you will get a call for the updates. (1:02:40 pm) DiGi Customer: ok. i hope i can get my refund asap. this thing is not fun. (1:02:54 pm) DiGi Customer: you will see this conversation on my blog soon. (1:03:05 pm) Thank you and have a nice day. And the CS of DiGi as well clear some of my questions about this service. 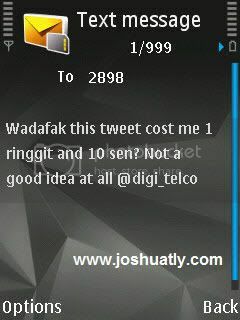 Cost to send a tweet via GladlyCast is also RM0.10 (For DiGi Prepaid Customer) and RM0/06 for DiGi Prepaid Campus customers. So if you dont need to check your tweet every single second (While the promise is a lie, means u dont got to do so anyway), why dont use GladlyCast? Its much more cheaper! GladlyCast: the service is free but u pay for the bill to SMS to a maxis number. 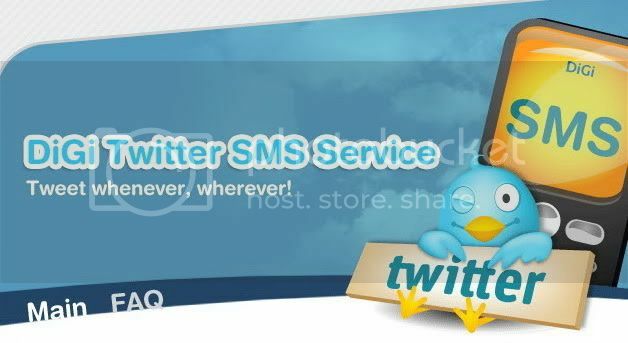 Forget about the DiGi Twitter SMS Service. Wait, as far as I can see (& read), DiGi didn’t ‘promised’ you anything, nor did they renege on anything. how is this a lie? if you read the conversation, i supposed to receive sms whenever my twitter timeline is updated right? But i didnt receive any. 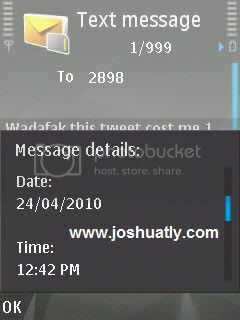 and they say i can tweet via SMS. but i cant do so. 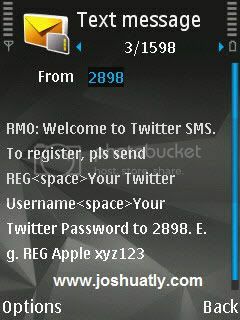 If you want the tweet via sms thingy so badly, you can try other option. 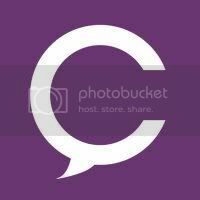 v-club.com – offer the feature you looking for, not free tho, but it works… or even better try 2gthr.com free sms post to ur twitter and fb too. 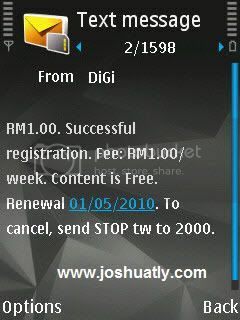 hmmm i think celcom got the rm1/week too, i think my gf used it, not sure what it called tho. and i still prefer gladlycast. u can try it too! oh, did they call you already?